I first saw this cookbook at the Vesterheim Museum in Decorah, Iowa. 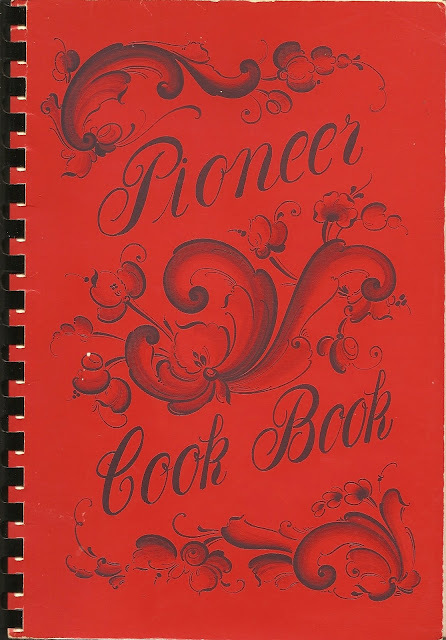 The Norwegian Pioneer Cookbook, printed in 1969, is an excellent example of why we like community cookbooks; the recipes are the contributor’s best, their “reputation” recipe. They also mirror ethnic or regional cooking at its best, without any extra interpretation by an author. Our dad's mother immigrated from Norway as a young woman...and we grew up around many Norwegians in Minnesota...all good cooks. Found the Norwegian Pioneer Cook Book for sale on the internet. A book dealer in Virginia had it. It was in pristine condition. Not a mark in it. It cost $23.00 delivered in the mail overnite. A lot of recipes! I am pleased with it. I've also got a copy of a Cajun recipe book (somewhere in my book stacks)in the very same format as the Pioneer cook book although the cajun book doesn't have nearly the amount of recipes (very few desserts), if my memory serves me correct.